Veterans and their family members were among those representing UCLA Operation Mend in the 2016 Veterans Day parade in New York City. Cities around the nation will hold Veterans Day parades on Nov. 11 to honor U.S. military veterans. The biggest parade of all will be in New York City, where more than 40,000 participants, cheered on by hundreds of thousands of spectators, are expected to march along a 1.3-mile route on Fifth Avenue. And, for the seventh year, a contingent from the UCLA Health Operation Mend program will be among the parade goers. Operation Mend, which provides health care services to wounded vets, will walk with about 50 people, including 10 patients, family members, physicians, staff and supporters. 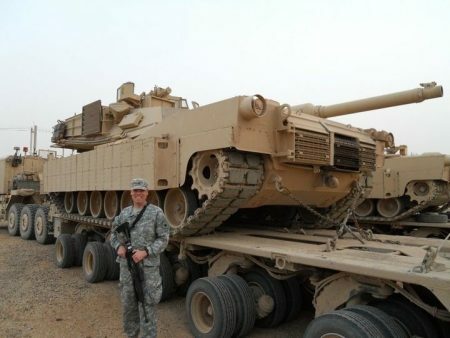 U.S. Army Infantry Specialist (retired) Tony Casada, of Central Point, Oregon, is one of the veterans who will be participating in the parade. 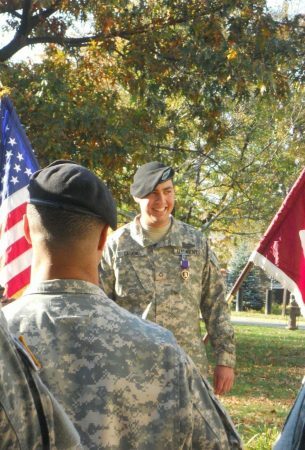 In June, 2010, Casada was on foot patrol in Afghanistan when he was hit by two improvised explosive device (IED) blasts. His group was doing survey work for the rebuilding of a schoolyard for the community when an IED exploded, resulting in severe injuries. As he was leaving the hospital six days later, the vehicle in which he was traveling was hit by another IED, causing it to flip over. In those incidents, Casada suffered traumatic brain injuries and damage to his lower back and right shoulder. He was later diagnosed with post-traumatic stress disorder, or PTSD. He and his wife, Antonia, participated in Operation Mend's six-week outpatient intensive treatment program, which helps veterans and their family members learn together how to cope with the invisible wounds of war. U.S. Army National Guard Staff Sergeant (retired) Michael Missel, of Whittier, California, is also walking in the parade. While stationed in Iraq, Missel was involved in two separate blast incidents that resulted in traumatic brain injuries and other injuries; he also was diagnosed with PTSD. Through Operation Mend, Missel is receiving surgical repairs to his hands, elbows and rib cage. He and his wife, Yvette, have also participated in the program’s intensive treatment program. The parade is broadcast live noon to 3 p.m. on New York’s WPIX-TV 11 and the American Forces Network. The event will stream live on the WPIX website, TaskandPurpose.com and Military.com. 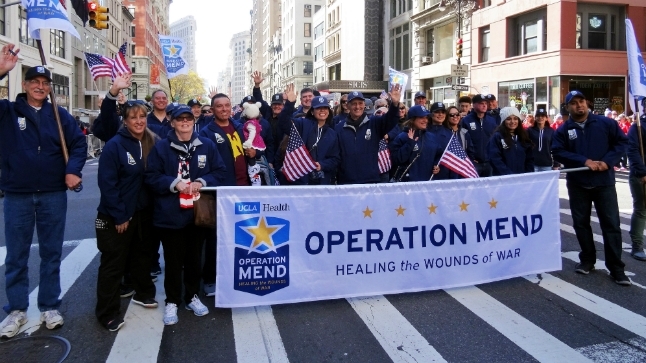 Founded in 2007, Operation Mend helps treat the wounds of war. Operation Mend provides advanced surgical and medical treatment and comprehensive psychological health care. 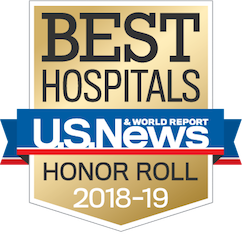 It also offers advanced diagnostics and treatment planning for patients with symptoms of mild traumatic brain injury and PTSD through the Warrior Care Network, a collaboration between Wounded Warrior Project, UCLA and three academic medical center partners. Operation Mend is available to eligible warriors injured during combat operations or while training for service. All medical care, travel and accommodations are provided at no cost to participants and their families. To learn more, please visit www.operationmend.ucla.edu. Ryan Hatoum contributed to this story.